Jannat 2 is the upcoming sequel to the Jannat (2008). 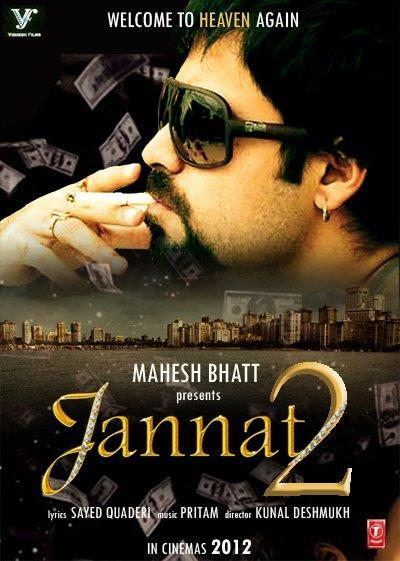 Jannat 2 is a Criminal thriller film directed by Kunal Deshmukh and produced by Mukesh Bhatt. Emraan Hashmi, Esha Guptam, Imran Zahid and Randeep Hooda were in the lead role for the movie. The story of Jannat2 is based on the issue of illegal arms in the Delhi.The film is released on April 27, 2012. Emraan Hashmi is working as Arjun in the movie, while Imran Zahid play a role of a Inspector named as Vijay Thakur.At first, Prachi Desai was signed for the lead role in the Jannat2, later she was replaced by ESHA GUPTA as Prachi Desai was not comfortable for being bold and sensual.